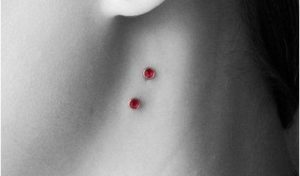 What is a Vampire Bite Piercing? 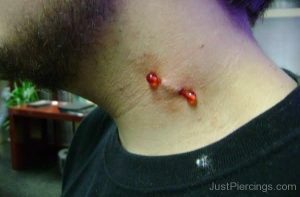 Vampire bite is a type of neck piercing that mimics the vampire bites from the fictional stories. It can be on either side of the neck and is also popular as a Vampire kiss piercing. This style of body modification is appropriate for anyone who wants to make a bold statement through appearance. It is an ordinary surface piercing that has all possibilities of migration and rejection. 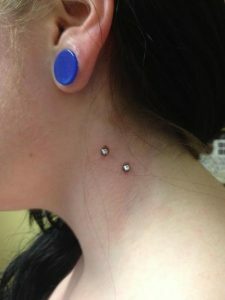 Placement is an essential part and should resemble a bite on the neck, so the distance between the two piercings should be standard. Select an authenticated parlor that is specialized in neck piercings and is APP certified. Cleans the area where the future perforations have to take place. Sterilizes the area and the piercing equipment before use. Inserts a hollow needle and pass it under the skin and exit it from there at some distance. Embellishes it with suitable jewelry of your choice. Cleans the area with a cotton swab as there can be some blood on the site of piercing. People do not report them to be very painful. Since it involves perforation and is likely to pain more or less according to the sensitivity of a person. Blood leakage and swelling are customary in the process. The pain goes down gradually, and it will stop hurting after 3-4 days. It takes about 2 to 6 months to recover completely provided it does not get infections. The swelling will gradually disappear in a few days. However, if a bump appears on the site, it can cause an ache. Try to cover up the piercing wound with a bandage to prevent entry of germs. Make sure the piercing doesn’t snag on clothes, hair, etc. Clean the area using a cotton ball soaked in a warm saline solution or H2O ocean cleanser spray. Eat nutritious foods rich in Vitamin B, C, and it will make the healing quicker. Keep the area covered by a bandage to avoid contamination. Consume alcohol and other hard drinks. Avoid wearing any necklaces or neck jewelry. Do not touch the piercing with dirty hands. Play, fiddle with or remove the jewelry. Avoid stretching or straining in the piercing area as it can cause tearing of skin and other injuries. Redness, pain, and inflammation near the piercing area. Itching sensation and excessive irritation. Pus discharge from the perforation. Occurring overall sensitivity in the neck area. Clean the pus and blood on the piercing site. Do not remove the jewelry. Visit a doctor for his advice. 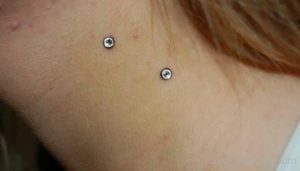 As it is a surface piercing, the jewelry should be suitable for surface piercings. It should be such that it reduces the risk of rejection and migration. Vampire bites look good with curved barbells as straight barbells do not go well with this type as they can result in rejection. Teflon barbell is a common choice. Titanium and surgical Steel studs are the next most preferred jewelry material. Gold neck piercings can invite infections unless it is a pure 24-carat piece. 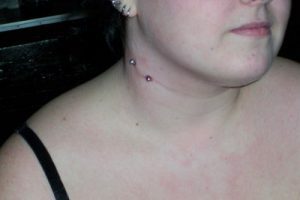 Neck piercing costs $50 on an average. The price can be low or high depending on parlor. It is advisable not to compromise on the quality to cut the cost.